As the week progressed our faces became dimmer and dimmer, as the weather forecast continued to be unfavorable for our annual pilgrimage to Fuji san. But when Sunday came around it was cloudy, but the broken cloud deck hovered around the 4th station and was pretty clear on the Fujinomiya side; looks like the low sped up and passed over to pacific 6 hours faster than the forecast. As we met up with the rest of the group at Gotemba, everybody’s face turned from relief to a determination to get to the top that day. This is my third time to get to Fuji san with sticks on my back. The first attempt last year was foiled by the bad weather, and we only made it to the 7.5th station, but a week later two of us got to the top in spectacular sunshine. After that second attempt last year, we thought that our other friends really should get a chance to come up here, so we promised ourselves to return next year. 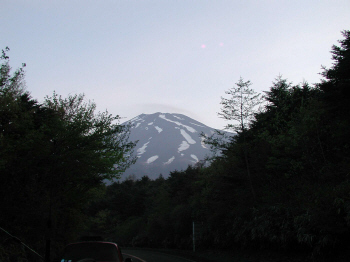 Fuji has three trailheads. Fujiyoshida is the oldest and located on the North side, and newer Gotenba and Fujinomiya are located on the South side. They are all at the 5th station around 2,400m, except Gotemba which is located a bit lower. The access roads that lead to each trail head are now free of tolls. In winter, those access roads are closed and in most cases the local government opens them in time for the Golden Week. The Fujiyoshida and Fujinomiya trails are the most popular amongst the sliders in spring. 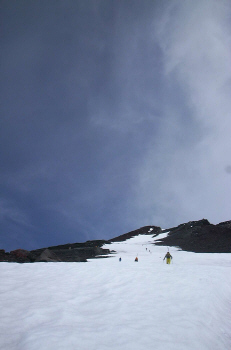 So the Fuji skiing season for most of us is between Golden Week and early June. 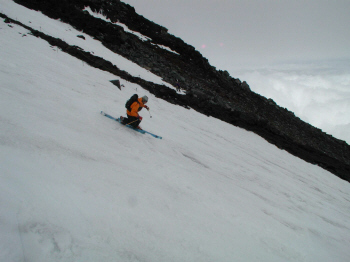 Skiing on the Fujinomiya side is in actuality, hopping one snow patch to another down to wherever it ends. In the photo from this year, the first patch starts at close to the top and bends to the right, and you can see the second one below, then 3rd and 4th ones. Last year, the 3rd and 4th ones were already gone. 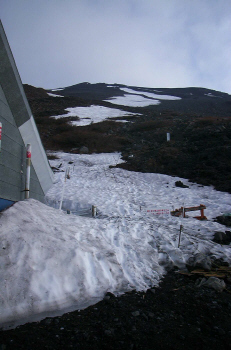 But this year, contrary to many reports, we slid all the way to the parking at 5th station. There are not a lot of things you need to take but because of the high altitude, being in a good physical condition - especially in good cardiovascular condition - will greatly reduce your chance of high altitude sickness. Also, having a good night sleep the night before in highly recommended. The typical symptom up on the mountain is a pounding headache and nausea. This will really hamper your descent. I am now thinking that a stay overnight at the 5th station next time to get used to the altitude might be a good idea. We only took water (I took 3L), a first aide kit, a repair kit, some lunch, trail mix and crampons. Although we did bring our avalanche toys, looking at the snow patches we decided those are not needed. If you have them, a map, compass, and altimeter (or a GPS) may be handy in case of fog. Some people prefer to hike with their regular hiking boots, as you can hike on the summer trail to the 9.5 station. 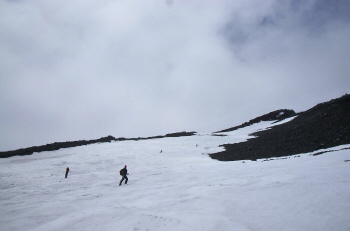 After that, you would climb on the snow almost to the peak. 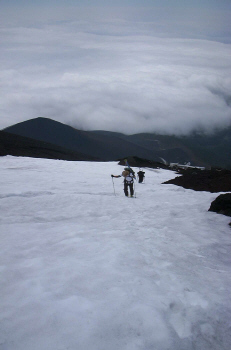 This is the part where you may need a pair of crampons, but we did not use them as the snow was fairly soft. You need to dress as if you are going skiing in winter. That means that you may be sweating like a pig till the 8th station, but as you gain altitude, it will be cold. From the parking lot, you traverse to the 6th station first - you cannot see the snow patch from the parking, and this is the easiest part. The rest of the climb gets really hard from that point onwards. The trail leads to the peak almost straight up. You've got to keep yourself hydrated and have a candy bar or some sweets handy. The volcanic trail is very tough on you as well as your boots, so you need to go slow and try not fall over as you may injure your knees, ankles etc… If you by any chance you start to feel ill, pushing it just makes it worse and aspirin does not work and in that case sooner or later you will have to make a decision to drop out or keep going. It is up to you. We had two drop outs on our outing - one at the 7th station (he skied down) and the other at the 9.5th station (he had waited for us to come down). The trail has a series of shacks at each station for the summer climbers, but of course those were all closed because of the time of year. It is a great place to take off your pack and rest up and also for your pace adjustments. Everyone feels the hike differently, but for myself the 6th to 9th station was the hardest (ha! almost all the way! 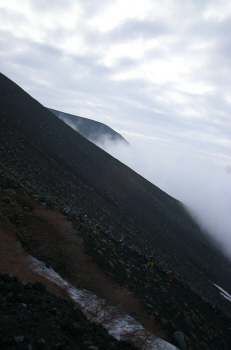 )....in particular, after the 8th station (3000m) I felt the air get really thin and breathing became very hard. If you climb on a weekend, you will most likely be joined by other parties, so you don’t feel alone on the mountain. Trails are very well marked and there is a very low chance of getting lost there. But, I would make sure to observe where the snow patches are and figure out what will be the better way to get down. Some patches have tough access if you are not careful, for example there might be small cliffs to get to them. The Fujinomiya side peak is at 3,700m, 76m short of the real peak. If you still have anything left you may want to have the final ascent to the (now being decommissioned) observatory. The observatory has been the symbol of Fuji-san’s peak for many years with a radar dome at the top. But now it is dismantled and the place is slowly being taken apart. 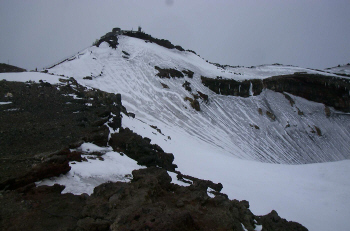 As a volcanic mountain, Fuji san has a bowl at the peak - I would say 150m deep - and you can ski down it if you don’t mind the hike up. Typically the peak is windy all the time, but it will get stronger in the afternoon. So we ate our lunch (some brought beer), and hiked down to the snow patch about 50m below to start our sliding descent. You know, a lot of us did not realize that at this altitude, skiing is also very hard. You make a few turns, stop, and catch a breath. Since we wanted to savor our descent, we stopped frequently to take photos and videos. The snow is spring corn snow, but there are patches of pebbles that you do not want to ski over. Also, there are sometimes there are falling rocks. Those pillow size rocks can start to tumble and since nothing there to stop it on snow, it can roll pretty fast. We saw two of them. As long as you are aware they are not dangerous, but you should have your eyes out for them. As I mentioned earlier, you need to assess where to hop over to the next patch, during the ascent. This will make your decisions easier on the way down. 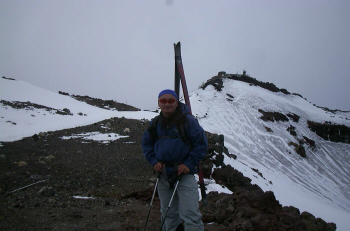 Q: Hey, did you guys hike to the peak and ski down? A: No, we just used a secret elevator!! We had started at 5:45 AM and reached the peak at 11:45AM. By the time we got back to the parking lot, it was 2:00 PM. I think many of you agree that no ski trip is complete without onsen. This time we went to Mitainai onsen near the US Marine Base on the way to Gotemba IC. The place was a bit expensive (1000 JPY), but clean and the big rotenburo was a welcome finale to this trip.